Speaking My Mind: Crazy weather! Actual degrees are 81 and it only feels like 85 degrees F! Brrrrrrrrrrrrr! Mind you without rain even! The humidity is at 75% though, nasty there. 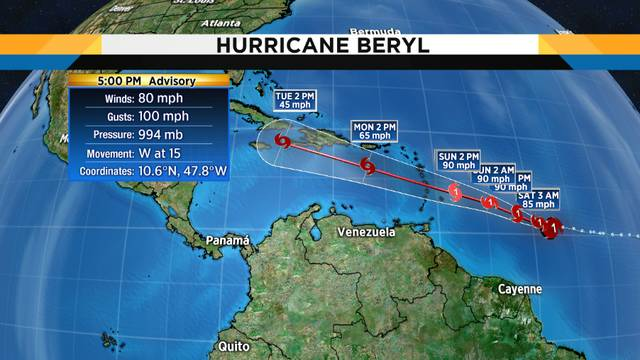 We now have Hurricane Beryl thousands of miles away in the southeastern portion of the Caribbean! And she will most likely not be coming towards any land mass at hurricane speeds, perhaps tropical storm? Alberto, our first named storm before the season officially began in May never became a hurricane, only a tropical storm, still creating havoc in so many areas! The tropical depression off the Carolinas too could form into something bearing watching!